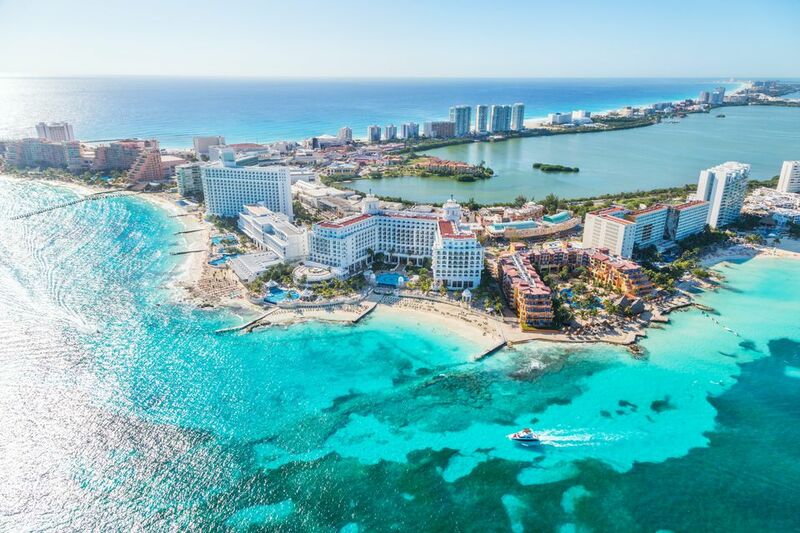 Cancun's lively Hotel Zone (Zona Hotelera) with ocean and lagoon waterfronts, is a magnet for tourists who want dining, shopping, and nightlife all in one area. The Hotel Zone, including the Underwater Museum of Art and the Scenic Tower Cancún where you can view the city from an observation deck, is very popular with families, too. Most higher-end properties are not all-inclusive, so if you're after that extra pampering, you might consider some Luxury Cancun Resorts that Welcome Families too. Families can enjoy day trips to the Mayan Riviera to explore Mayan ruins, a coral reef, the Xcaret eco-theme park, and more. Convenient all-inclusive resorts that welcome families include these Cancun favorites. So near busy Cancun and yet so far, the value-priced Avalon Reef Club has its own private islet on laid-back Isla Mujeres. Guests can enjoy the gentle beaches stroll to a friendly little town, or take a day trip. The MÍA REEF Kids Club is available from 10 a.m. to 5 p.m and offers supervised activities for children from 4 to 11 years old. Nearby are a sculpture park and turtle farm where children can learn about conservation techniques and how to help ensure the survival of the sea turtles which are released to the sea after hatching. This all-inclusive Cancun resort is in the heart of the Hotel Zone and has a kids club. Guests can "play" at other Palace Resorts, such as the Moon Palace Golf Resort and Spa. The resort offers "resort credit" (for specified stays) that guests can use for treatments at Awe Spa, golf at their Jack Nicklaus Signature Golf Course, or to take day trips and excursions. The resort's supervised playroom includes gaming technology and immersive play spaces. There are scheduled events and activities. This all-inclusive Cancun resort has a prime location—its own 22-acre quiet peninsula at the edge of the crowded Hotel Zone. The Club Med brand has a unique ambiance thanks to several signature features. Families will find a Baby Welcome program, Mini-Club Med for ages 4 to 10, and "Passworld" for 'tweens and teens. Activities include snorkeling, sailing, and trapeze. The resort is 6 kilometers from the Wet'n Wild Cancun water park and 7 kilometers from the Museo Maya de Cancún. Just 9 miles from the airport and at the quieter end of the Hotel Zone, this all-inclusive Cancun resort is family-friendly, works for larger families, ​has four pools, and a supervised kids' water park. Families will enjoy mini golf, a baby club for ages 18 months to 3 years, and a kids club for ages 4 to 12. Children 4 to 12 years old can ride the resort's zip line, too. For every adult who pays for a single or double room, a child from 0 to 12 years old can stay free of charge. You can enjoy pedal boats, yachts, and kayaks at the Aquaworld Marina located 5 minutes from the hotel. This all-inclusive Cancun resort has a choice location in the Hotel Zone, close to restaurants and shops yet with the ocean on three sides, has private beach areas, and a lagoon. You can drop off the kids at the Explorer’s Club or let your teens hang out at the Core Zone. The Explorer's club, for children 3 to 12, is open 9 a.m. to 9 p.m. There are daily activities developed around nature, science and exploration of the outdoors. Once a week, the Explorer’s Club offers a camping adventure on the beach. This all-suites property has a kids club and a lagoon pool and is regularly named a AAA 5-Diamond property. At the time of writing, this is not an all-inclusive resort but Fiesta has changed several resorts to inclusive pricing. At Coral KidZ Club, children from 3 years old to teens will find something fun to do. For the little ones, there is an area where kids 3 to 5 years can choose their own environment: city, park or jungle. Teens will have fun with the video games. There is also an arts and crafts area, dance floor, and theater with dressing room including wardrobe and make-up stations. Outdoors, there are basketball courts, a track for remote-controlled cars, and a space for traditional Mexican floor games. Just south of the airport and well-positioned for day-trips in the Mayan Riviera, the all-inclusive Moon Palace has nice extras such as miniature golf, a climbing tower, and a Jack Nicklaus Signature golf course. Guests can play at other Palace properties. There are tours to natural and archeological sites where you can apply your resort credit. On-site there is a supervised children's playroom. Another busy, value-priced all-inclusive Cancun resort that's large-family friendly, this property has a kiddie pool with waterslide, a large playground, and, a plus in Cancun where the sea can be rough, a sheltered, shallow beach. You can use kayaks and paddle-boats as part of the all-inclusive price. The resort has activity rooms with ping-pong tables, toys, and video games. The supervised kids' club is for children 3 to 12 years old. Riu is a Spain-based company with over 100 properties worldwide. Riu has several all-inclusive resorts in Cancun, including this one in the Hotel Zone. Features here include a kids club, water sports, and family activities. The resort has a gym and entertainment for all ages, including the RiuLand program for the little ones. Tours that can be arranged for your family include going to Chichén Itzá (the fantastic Mayan ruins) or Isla Mujeres where you can learn about the protection of baby sea turtles. You can also visit the museums showcasing the history of the region. Formerly Sea Adventure Resort, this value-priced property has an on-site water park play area that is open to the public also. The Kids Club welcomes children from 4 to 10 years old for supervised games, activities, and original crafts. Teens will enjoy "Iki's Game Room" with ping-pong, foosball, air hockey, and billiards tables. Staff is nearby.